The CW has revealed its 2012-13 schedule ahead of this morning's upfront presentation. 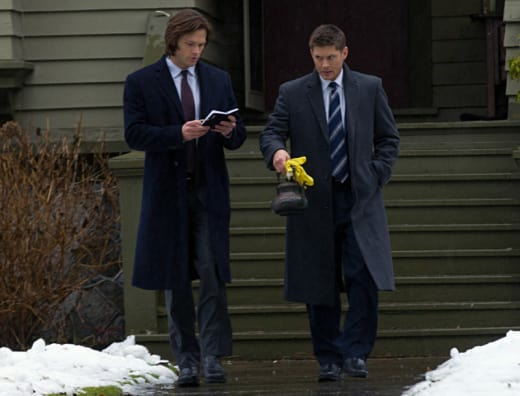 Perhaps most notably, Supernatural moves to Wednesdays at 9 p.m. following new comic book series Arrow. America’s Next Top Model receives a demotion to Supernatural's old slot, Fridays at 8 p.m. Meanwhile, Hart of Dixie is moving from Mondays at 9 p.m. to Tuesdays at 8 p.m. where it will lead into the new medical drama Emily Owens, M.D. (formerly called First Cut), starring Mamie Gummer. Beauty and the Beast won the time slot lottery, scoring the Thursday, 9 p.m. position after The Vampire Diaries. The spot was vacated when The Secret Circle was added to the dreaded list of cancelled shows. Finally, Gossip Girl Season 6 - the show's 11-episode farewell - will air Mondays at 9 p.m., with the series bowing out this fall. The Carrie Diaries will take over in that slot at mid-season, premiering in January. Cult, starring TVD alum Matthew Davis, is also set to debut in mid-season, date and time TBA. In addition to The Secret Circle, Ringer, One Tree Hill, H8R, Remodeled and The L.A. Complex will also no longer return. Which will you miss most? Which of the new shows are you most excited for? Discuss!